Xolos, on the pitch with Real Madrid or Barcelona? How’s this for an early Christmas present? By early December of this year, Tijuana could very well be facing off against teams like Real Madrid, Barcelona, Bayern Munich, Chelsea or Paris-Saint Germain. The "how" is a bit more important than the "why." Despite being horribly undervalued, boasting a confusing calendar and having to be heavily dependent on Mexican and American teams, the CONCACAF Champions’ League does have its attractiveness. Mainly, the fact that winning it gives you a chance to stack up against the world’s best in the FIFA Club World Cup. The final fruits from the Antonio Mohamed era in Tijuana are being harvested in the form of a berth to the continental tourney and a chance to be crowned world champions in Morocco next December, squaring off against the top teams from Europe, South America and elsewhere. No team outside of Europe and South America has ever won it (sound familiar? African, North American, Asian and Oceania national teams have yet to lift the World Cup, as well) and, surprise – Brazilian teams lead the charge with four titles in 10 tries. So why would a team like Xolos ever be considered any type of contender for such an honor? First of all, the CONCACAF Champions’ League isn’t that difficult of a tournament to win (just don’t tell that to MLS teams.) Since the current format was adopted in 2008, only three teams – all Mexican – have won it. Atlante, Pachuca and Monterrey. The top Mexican squads such as Cruz Azul, Chivas, Club America and Pumas simply don’t make it their highest priority. MLS teams, burdened by their atypical schedule, are usually out of rhythm by the time the knockout stages roll around. Central American teams, despite their valiant efforts, simply don’t have the payroll and talent level to compete with the North Americans. 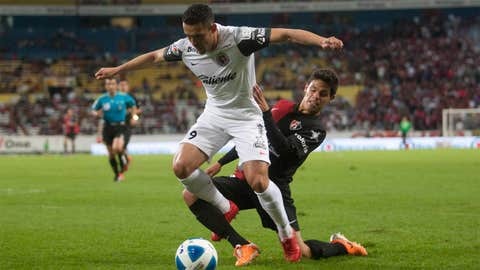 While Tijuana anchors to return to the Liga MX playoffs for the first time since the second half of 2012, the allure of more international recognition is something that does not escape the Baja California team’s upper council. Mohamed would regularly joke that team president Jorgealberto Hank would "scare" him with his lofty ambitions. Under Mohamed, Xolos were just one goal away from making into the Copa Libertadores final four in 2013. No Mexican team has ever won the South American club competition, and eventual winners Atletico Mineiro were the ones who ousted the scrappy Xolos. Knowing full well that they’d trade the Libertadores off for the CONCACAF Champions’ League, Hank made a not-so-quiet vow: that his team would win it. That hope was almost immediately dashed. Under former coach Jorge Almiron, Tijuana limped through the Liga MX and put its FIFA Club World Cup ambitions in a specter of doubt when the team had nearly fumbled against mostly inferior opposition. Enter Cesar Farias, the ambitious Venezuelan manager who put la Vinotinto in its first World Cup of any kind, the U-20 tournament in 2009. Under the "South American Mourinho," Tijuana has shown more of the Mohamed luster than the Almiron blunder, and the bar has been set once more to encompass the team’s international ambitions. Facing off against the Los Angeles Galaxy in the quarterfinals, the stage is set for a regional Clasico of sorts. Should Xolos jump that hurdle, they could very well face Liga MX top dogs Cruz Azul and Toluca after that. Both teams have manhandled opposition in the domestic scene, meaning Xolos would need yet another one of its little miracles to pull it off. No one said it would be easy. Then again, a game where the other team boasts Cristiano Ronaldo or Lionel Messi isn’t a piece of cake, either.